Or you can tip over the cup and glue it that way, so the birdseed looks like it’s spilling out. It’s more of an artsy look, like this bird feeder on Morena’s Corner, and less hardware required since the chain can be threaded through the teacup handle. 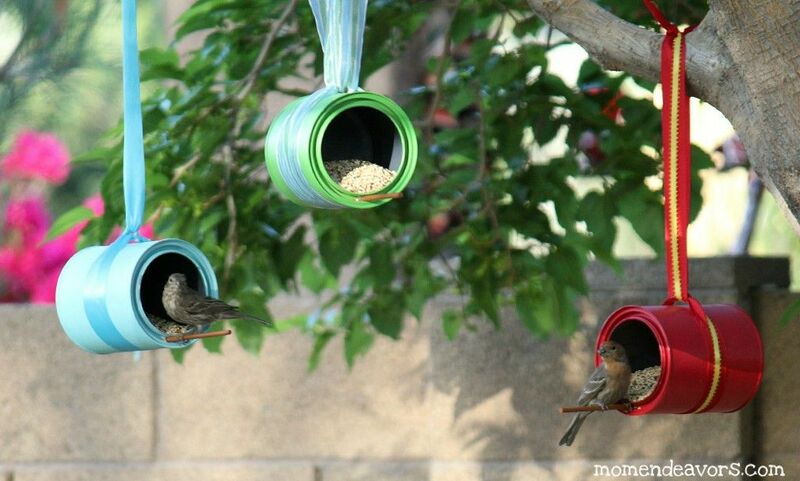 Finally, these painted can bird feeders look a little more involved, but they’re still super easy and kid-friendly. Use leftovers from your last painting project or grab some fun new colors. If you want to go all out, cut and paint dowels for the birds to sit on, or just glue a sturdy twig to the edge of the can. I especially like the idea of hanging the bird feeder by a ribbon (don’t forget a couple dots of hot glue to keep it from sliding off the can), but I’d probably go with bright contrasting colors instead of trying to match the ribbon to the paint. We’ve got you covered if you’ve got birds on the brain.